WELCOME to Dave Murphy! I'm sorry I haven't blogged since you became a Follower - don't take it personally. : ) I'll post more as I get closer to summer and start shopping in earnest for my RV, have my estate sale and... start full-timing! I didn't see a blog listed for you, let me know if you have one so I can follow along with you, too. The roof has been repaired, the mold taken care of, the walls rebuilt and painted, and my bedroom is back to normal. The construction crew painted all the walls and the ceiling, too. The room looks really nice and it's sooooo nice to be back sleeping on a regular bed again. This is where the main leak was. All the decorative items, photos, pictures on the walls were removed during the repairs and construction, and I'm not sure I want to drag them all out again, put new holes in the walls, etc., when I'll be renting the condo sometime this year. We've had a couple of heavy rain storms since they repaired the roof, and I was so glad I didn't have to worry about the water coming in anymore. Katie is pretty happy, too. She can stay home and sleep during the day, now, instead of having to come to work with me and stay in the car or in her crate in my office. She was getting real tired of that crate, and after lunch - which I eat in the car - she wouldn't come with me back to the office. She wasn't getting her usual peaceful all-day-long sleep, and I think she's pretty happy getting back to normal, too. : ) Having my bedroom off limits had me more off-kilter than I realized until it was over. I've gotten the air quality report, and will recieve a final report this week. I'm going to put all the reports and photos in a folder and forget about them until I need them for a sale. So, now onward and upward! On Friday I started thinking about looking for RVs again. I hope to get one after the summer and stopped by Camping World to see what they had. They actually had one that I really liked - at least the floor plan. 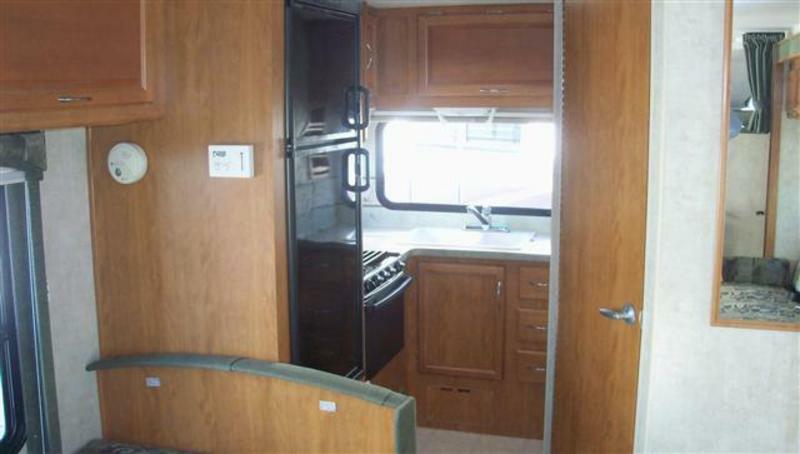 It was a 2005 Fleetwood Jamboree 23 E with the kitchen in the back. I keep going back and forth about what I think I want, and I'm back to my original floor plan. I really liked the floor plan and the extras the Fleetwood had, but I didn't like the interior color, it was very well-used (lots of chips, etc.) and had a musty, uriney smell. The salesman said it's easy to change out the colors and he could reduce the price to reflect what that would cost me, but the smell really bothered me. He said it was probably from the tanks, but I haven't smelled that in other used RVs I've seen. It's $39,995, which seemed high for a 2005, but I don't know much about pricing yet. Of course I know they would come down, but not to $30,000, which he said someone else had offered and the offer had been rejected. Around $30K is the neighborhood I'd like to stay in. So, it's not the one for me, but I'll definitely be looking for that year and style. If I found the perfect RV for the right price, I'd try to get it now. I think I could swing it, and I'd just lease my condo sooner and stay in a local RV park while I'm still working. That's the plan in the fall, but I could do it earlier. 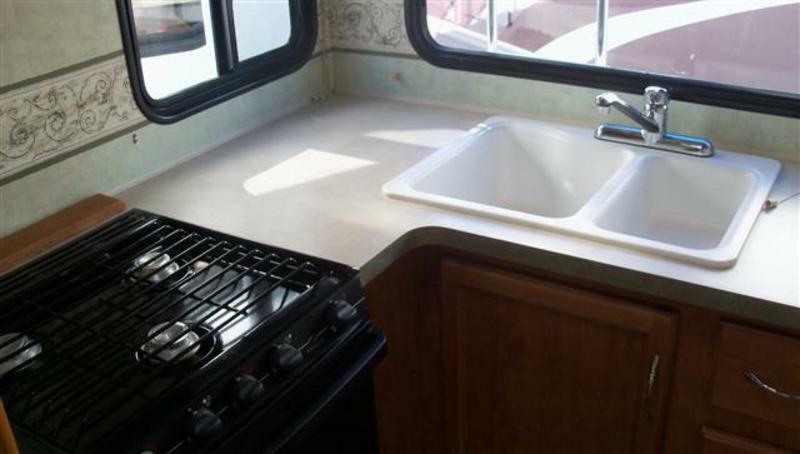 Have you changed colors inside your RV? Had the cushions recovered? I wonder what that would cost me. There's a local place, the salesman said, that they would refer me to, so I guess if I find the perfect rig with a color I don't like, I would look into it. I could always paint, change out wallpaper borders, and change the flooring. Since I'll be buying used, that would probably all be a good idea, anyway unless I find a particularly clean unit. On the way home, there was an estate sale going on a few streets from mine, so I stopped to talk the the owner of the company putting it on. I wanted to know how they work, and what it costs to hire them. It was pretty interesting. I'd have to be moved out, then they come in on a Sunday, stage everything left in the place, price everything, and place ads in local papers and in lots of internet sites from here to Los Angeles. He said most of the good stuff is sold through the ads on Wednesday and Thursday. The serious shoppers drive to sales on Wednesday/Thursday while the best stuff is still available. The "Estate Sale" signs go up out at the main road and around the neighborhood on Thursday and the sale is on through Sunday. At the end, everything not worth worrying about is left for Goodwill or similar companies that come out and pick them up and leave receipts for me for tax write-offs. He has a warehouse that he uses to store things that are still worth selling, and he brings them to the next couple of sales and tries to sell them. At the end, he keeps 35% of the funds earned. I'd get 65%. 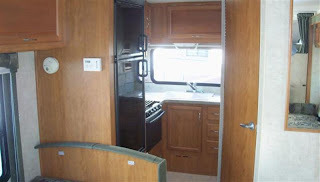 I love the idea of taking only what I need in the RV, what I want to store, and what I want to throw away, and leaving the rest for them to deal with. That's worth 35% to me. It's all done in a week, and they probably get more people to come that I'd ever get, and they know how to stage and price things, so they would probably sell more. Like every job, there are tricks to the trade, and he knows them. When everything is gone, I'd take the next week to vacuum, clean the patio, kitchen and both bathrooms, do a little painting where needed, and that would be it. In two weeks or less it would be ready to lease. One of the things I've been dreading is the "getting rid of everything" phase. It seems like such hard work, takes so long, and is so emotionally draining in many of the blogs I've read. I live in a really safe area, but after posting items in Craig's List, I worry about the peole who came in and looked around. Although I did well and sold a lot of things, I don't think I want to do that again. I've heard too many horror stories. I like the idea of an Estate Sale, which eliminates all that. So, that's the plan. All I have to do is find the perfect little Class C and I'm on my way! Katie proudly walking around with both her chew toys in her mouth. I find it interesting to read blogs when the writer is questioning their purpose for blogging, what it means to them, whether they should continue, etc. I just read GYPSY G-MAS' post about this subject. It was very thoughtful, and I enjoyed reading all the comments. I started to comment, too, but then thought this might be a good post for me to document why I'm doing this. I started blogging because I plan to RV full-time and when I first found RV blogs, I really enjoyed reading about the people who were just starting out and making all the decisions that are necessary to become a full-timer. I was learning not only about the mechanics of getting into full-time RVing, but also the emotional part of getting rid of everything, selling or leasing a current home, buying the RV, and taking off, and all that really helps, too. I also enjoyed reading about those of you who were on the road, where you went, how you managed things, the camaraderie on the road, meeting up with people in person after reading and getting to know them through their blog. I live vicariously through these blogs. I used to say when I'd close my laptop after going through the day's posts, felt like I had been on vacation. Not so much anymore, because I pretty much follow you all every day, and I'm used to it now. So, I decided I would start a blog, too, and document the steps I'm taking to join the full-time RVers on the road. I wanted to be able to go back and remember what I did, how I was feeling, etc., and once on the road, it would be a good way for my kids to keep track of where I was, and to know I was safe and happy. I wasn't going to make it public, but I told a few people, and like a box of See's Candies, you can't stop at one or two. Once I opened the box, I decided to share with everyone. I started commenting on other blogs, and followers signed on to mine. I wanted to blog every day and at first I did, but right now my life doesn't have that much going on to blog about every day. I just live, work, etc., I'm not a very social person, but I DO bring my camera with me and snap photos when I find something interesting. I also keep finding more and more blogs I want to follow, and reading them regularly takes a lot of time, and usually I'd rather read those than post something here that doesn't really matter to me. I hope to be on the road this time next year, so I'll have lots more to write about in the coming months and will post more as that happens. 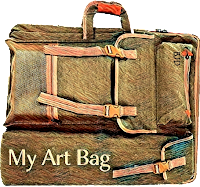 I am also going to have an account somewhere on-line where I can organize my photos, so I will have an easy way to share them and have a pictorial history of my travels for myself. On a different subject, the little Camellia tree in my back patio area is in full bloom. It's actually been blooming for a while now, it seems to bloom for a long time, but right now it's covered with blossoms. When I took these photos I kept getting a round image right in the middle of the tree. From this angle it isn't as noticeable, but it's frustrating to not get a clear photo. I wondered it it had something to do with the angle of the sun. The camera lens was clean, and I could snap in other areas without getting this spot. I got the results back from my blood test and I was exposed to mold. According to the doctor, the particular mold in my blood test can cause asthma, which will diminish when the mold is gone, and COPD, which was diagnosed last year, that won't go away. Because of the two issues, I need an inhaler which I use morning and night. Not a big deal, just tightness in my chest in the evenings, but since using the inhaler, I have no breathing problems at all. I just hated to have to rely on a prescription med, but I guess at 66 I'm lucky that 's all I need so far. My bedroom is still sealed, no action for the last few days, but today when I came home there was a new seal, a better one with a zipper in it, so someone was working here today. Last Friday they took away the big HEPA filter fan that was there last week. A surgical office in the area was found to have a really bad mold issue, so they took it there. I can hear it again behind the plastic seal. This was the previous seal, loose thick plastic covering lighter plastic taped around the opening. Today's new seal. Nothing is getting in or out. The blue strip is a zipper. It appeared work was going to start on Tuesday afternoon, and I was concerned that there had not been time to get building permits, if we needed them at this point. They did get the permits for the first two units they've had similar problems with. I e-mailed the contractor Tuesday and told him I want to make sure we have all the permits, etc. that I'll need to show when I sell my place. I don't want to have a buyer, and lose the sale because I have to disclose this leak and don't have proof it was repaired correctly. I'll also get a certification from the testing company that the area is safe. That seems to have put the work off by a few days. In talking to my insurance company, I understand we probably don't need permits for the mold removal and cleanup. But since there was a lot of termite and water damage to at least part of this load bearing section, they will need to remove and rebuild part of the wall. I was told I'd get copies of all the reports and photos the contractor sends to the HOA and I've gotten nothing yet, so I also sent an e-mail reminding him that I wanted to be copied on those. Ohhhh boy! Not a good way to start! You know the worst thing to say to a woman who is upset is "Calm Down." I called my daughter and went through my concerns with her. Kristy really helped and after we hung up I did feel better. Katie and I are still sleeping on the mattress on the guest room floor and she is still going to work with me every day. She is so good I forget she's there in her crate right next to me. At lunch I always sit in my car and listen to my books on tape while playing a game on my phone. (Who would have understood that sentence 25 years ago?) When I was ready to go back into the office, Katie wouldn't get up and come with me. She's so used to sleeping all day, I think the constant activity in the office is keeping her awake and really tiring her out. Poor thing. She used to get me up in the morning and be so excited to go out in the yard, and now I get up and make the bed around her. She doesn't move, just a lump under the bedspread. She crawls out between the pillows when it's time to go potty and get in the car. I'm not really inconvenienced by the bedroom being closed off, but it is affecting poor Katie. It will be nice to get back to normal.